Ο πρώτος τόμος κόμικς Robin Son of Batman, με τίτλο The Year of Blood, περιλαμβάνει τα πρώτα 6 τεύχη της σειράς. Από την DC Comics. Back from the dead, Damian Wayne is reassessing his life, and that includes being raised and trained by Talia and Ra’s al Ghul. To complete that training he spent a year completing seemingly impossible tasks in the service of the Demon’s Head—the Year of Blood. Time has come for Damian to atone for his sins and make right from wrong–the Year of Atonement. 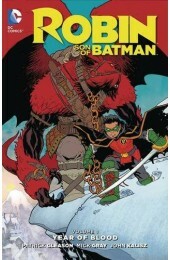 Patrick Gleason (BATMAN AND ROBIN) takes the reigns as writer and penciller along with MICK GRAY and JOHN KALISZ in this thrilling new series. 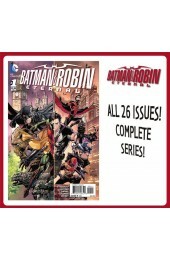 Collects ROBIN: SON OF BATMAN Sneak Peek and issues #1-6!